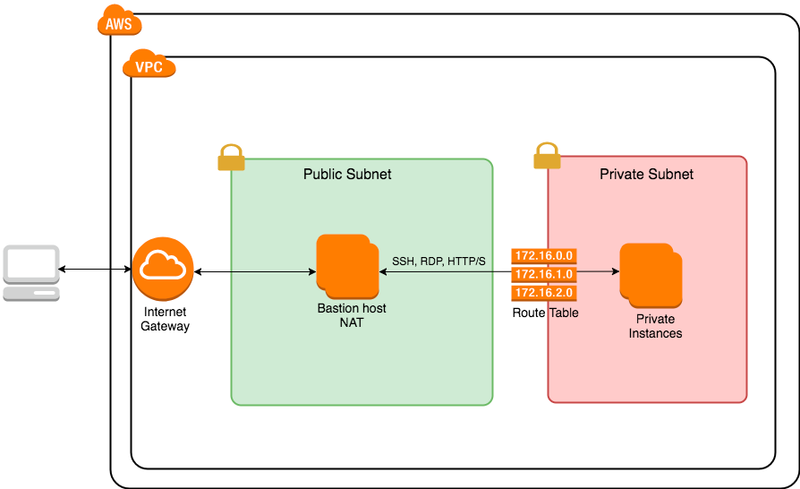 In this lab you will design a VPC with a public subnet, a private subnet, and a network address translation (NAT) instance in the public subnet. A NAT instance enables instances in the private subnet to initiate outbound traffic to the Internet. This scenario is common when you have a public-facing web application, while maintaining back-end servers that aren't publicly accessible. A common example is a multi-tier website, with the web servers in a public subnet, and the database servers in a private subnet. You can set up security and routing allowing the web servers to communicate with the database servers. The instances in the public subnet can send outbound traffic directly to the Internet, whereas the instances in the private subnet cannot. The instances in the private subnet can access the Internet via the NAT instance in the public subnet. In this Lab, you will also increase the network security using a network access control list (NACL), which is an optional layer of security that acts as a firewall for controlling traffic in and out of a subnet. After completing this Lab, you might consider setting up network ACLs with rules similar to your security groups, in order to add an additional layer of security to your VPC. May 24th, 2018 - Clarified instructions for connecting to the EC2 instances on Windows. Greg has been a consistent high performer for pioneering technologies in the wireless web industries with an illustrious career that is a testament to his breadth of knowledge. Dabbling with MS Azure, at Cloud Academy, Greg really thrives on evangelizing the benefits of Amazon Web Services. A dedicated and passionate professional who learns new and emerging technologies quickly, Greg always ensures the highest quality and caliber of everything he produces.